35 North Contemporary Fine Art, in the heart of Brighton’s North Laine, is delighted to present a collection of Pam Taylor’s (ARBS) finely observed and beautifully executed portrait sculptures. 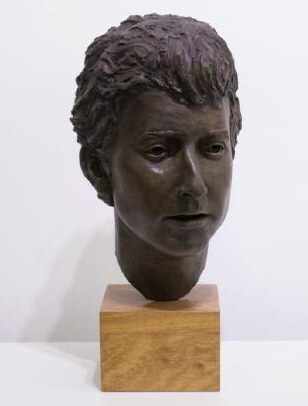 From Shakespeare to Bob Dylan, Bomber Harris to Shelia Hancock, this is a unique opportunity to view the work of one of Britain’s finest portrait sculptors and is the first public exhibition of Pam’s work since 2008. Pam’s name may not be immediately recognisable but her work is very much in the public consciousness – the sculpture of Shakespeare at the Globe Theatre, the Dockside Urchins at Tobacco Dock and the life-size airman at Plymouth Hoe are some of her best loved public works. Trained at the Sir John Cass College (now part of London’s Guildhall University) Pam emerged as one of the most talented portrait sculptors of her time. As well as the previously mentioned public works, Pam created sculptures for an extremely varied clientele – from the sculpture of Bob Dylan and Woody Guthrie which stands in Felix Dennis’ Garden of Heroes and Villains to the busts of Douglas Bader and Bomber Harris that were commissioned for the RAF Museum Hendon, everything Pam did bore the trademark of her keen eye and meticulous style. This entry was posted on May 29, 2015 by mptask in 35 North, Brighton, July 2015, June 2015 and tagged 35 North, art, art exhibition, brighton, Pam Taylor, sculpture, sculpture exhibition.